If Oprah Can’t, Why Do You Think You Can? I’ve been under the weather for the last 24 hours and so taking some time out from the kitchen and ‘resting’ in bed (feeling better now, since you ask). This gave me a good opportunity to browse around and look at new year and January postings on dieting, regimes and so-called ‘success-stories’. Some were inspiring, many were depressing and just a couple caught my attention enough to read to the end. There are no doubt long-term “success stories” out there – people who just by making (often radical) changes in their diet and activity behaviours have lost a substantial amount of weight AND are keeping it off. However, there is also no doubt that these people are rare and far between – which is exactly what makes each one of them so exceptional. I am not speaking of all the people we hear or read about who have lost tons of weight – we hear about their spectacular weight loss – cutting carbs, cutting gluten, going vegan, going paleo, alternate day fasting, running marathons, training for iron man competitions, going on the Biggest Loser or eating at Subway. What we don’t hear about is the same people, when they put the weight back on – which, in real life is exactly what happens to the absolutely vast majority of “losers”. We hear of their “success” and then we never hear from them again – ever. Oprah is different! Different because, we have had the opportunity to follow her ups and downs over decades. 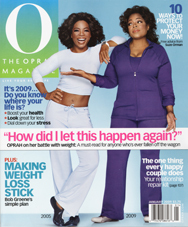 When Oprah “succeeds” in losing weight, she does not disappear into the night – no – she puts the weight back right in front of our eyes, again and again and again and again. Tags: diets, obesity, resolutions, success Categories: Bariatric Buzz, In the news!